Yesterday (22nd February) the Grimorio Team went to Barcelona’s Mobile World Centre, where El Zerouno is held. 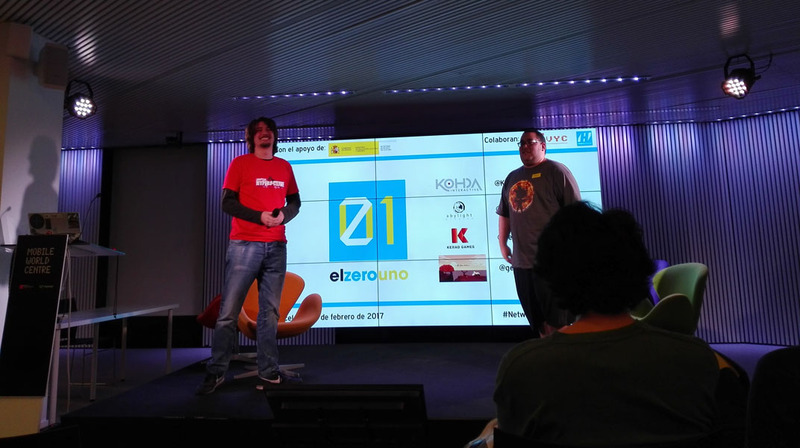 El Zerouno is a bimonthly event where Barcelona’s indie videogame scene meet up. People gather there, talk about their projects or studios, play some of the games that are being exhibited and have a nice dose of networking among friends and beverages (usually beer). In the event schedule, there is a particular portion called “Game Glory“. In this, people who have a project can sign up and defend their game in a “Elevator Pitch” format. Then, the public votes and the one who wins gets the opportunity to make a 7-minute presentation about their game in the next Zerouno. Of course, being ourselves from Barcelona too, we couldn’t let pass this oportunity. So last week we have been working on the Game Glory presentation (which can be only about 1 minute 30 seconds long), setting up this very same website, and making a simple trailer to be played while we are showing the game. We got there at 5p.m and set our laptop with Super Hyperactive Ninja on. People got to play it for a while, until the first presentations began, which let us have some feedback to improve the game. 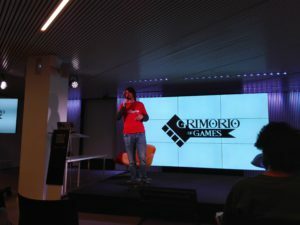 Then, we had an open debate about the role of the press in the promotion of indie games in Spain, and after that, George Batchelor (Hot Date, Far From Noise) talked about how he got to his current situation. Then, it was the turn for Game Glory. Surprisingly, no one but us was there to throw their pitch, so it was an automatic victory for us… except someone from the public (one of Víctor’s students) got onto the scenario and said he wanted to make a pitch too. That means we get to participate in the next Zerouno presentation in April, this time having 7 minutes. Now we have to prepare for the next event, so we have to work a lot to show lots of cool stuff!